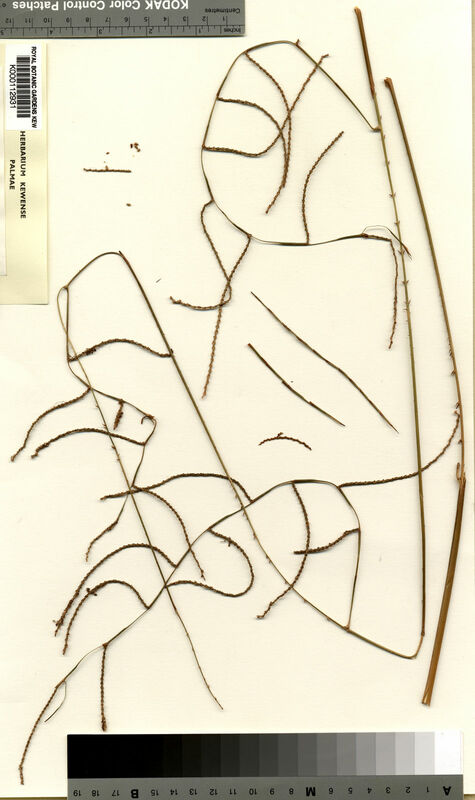 Solitary slender rattan, “stemless” or with a short erect stem to 50 cm, but rarely to 3 m or more; stem without sheaths to 10 mm diam., with sheaths to 30 mm diam., internodes very short, usually c. 10 mm. Sheath greenish-brown, ± unarmed or with sparse brown spines to 4 mm, except around the sheath mouth where densely armed with 2 rows of horizontal or erect brown spines to 5 cm long, the inner row generally longer and upward pointing; knee absent; ocrea absent. Flagellum absent. Leaf ecirrate, c. 85 cm long including the petiole to 20 cm; petiole armed with 2 rows of spines on each side as the leaf sheath, the spines decreasing in size towards the tip of the petiole; rachis with few reflexed spines; leaflets very regularly arranged, ± curved, the longest near the base c. 35 × 1.7 cm, both surfaces mid green, the lower surface also with 3 rows of short black bristles. Inflorescences elongate, very slender, tending to arch out of the crown, to 2 m long, whip-like; bracts closely sheathing, tubular, not very conspicuous, armed with reflexed grapnel spines; partial inflorescences c. 3, distant, very slender, bearing sparse slender rachillae to 80 × 1 mm; flowers small. Mature fruit rounded, small, c. 5 mm diam., strongly beaked and covered in 13 vertical rows of pale bright brown reflexed scales. Seed rounded; endosperm homogenous. Seedling not known. (Fig. 53). Known from a few collections from ridge tops in Temburong and Belait; elsewhere in Sarawak. Endemic to Borneo.